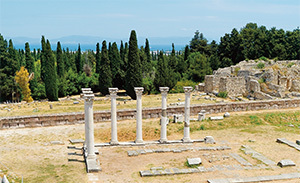 Kos town is the capital of the island. It combines historic monuments with a modern planning of broad streets bordered with trees, big squares, and houses with gardens. Throughout the town you will find an abundance of trees, bushes and flowers: fir, pine tree, cypress, eucalyptus, oak, jasmine, lilac, acacia and hibiscus. The combination of the stunning medieval architecture of the fortified city created on the islands by the Knights of Saint John, a Benedictine order founded in the 11th century, and the deep blue of the Aegean has also proved irresistible to Hollywood. In the 1960s and 1970s, Rhodes served as the backdrop for the blockbusters The Guns of Navarone, starring Gregory Peck, and Escape to Athena with David Niven and Roger Moore. Unesco has since declared the Knights’ medieval city, with the magnificent Palace of the Grand Masters and splendid cobblestone Street of the Knights, a World Heritage Site. The Castle of the Knights on Kos, although smaller in scale, is also quite impressive. Take a stroll on the rock paved streets of the old town where you will find numerous tourist shops or maybe lie on the sandy beaches under the sun. When it gets dark, there is a rich variety of restaurants and taverns with Greek and international cuisine. At night there are a number of places to go to, depending how quiet or ... wild you want to spend you night: Greek bouzouki, dance bars, discos. The villages of Kos are accessed through the main road of the island. The nearer ones can be reached by bicycle while the farther ones by motorcycle or car.